Poe Mageo, music instructor at the American Samoa Community College (ASCC), can now add “published author” to his already impressive list of credentials, after having a short fiction piece published in SPAN 64: Journal of the South Pacific Association for Commonwealth Literature and Language Studies. An academic publication which focuses on postcolonial, neocolonial and diaspora literature in English, mostly from the British Commonwealth nations, SPAN is issued biannually by SPACLALS, a sub-group of the Association for Commonwealth Language and Literature Studies. Widely referenced by literary scholars for its critical articles and book reviews on postcolonial literature of the South Pacific, a typical edition of SPAN will contain eight to ten scholarly articles, one or two book reviews, and a wide selection of poetry and fiction. 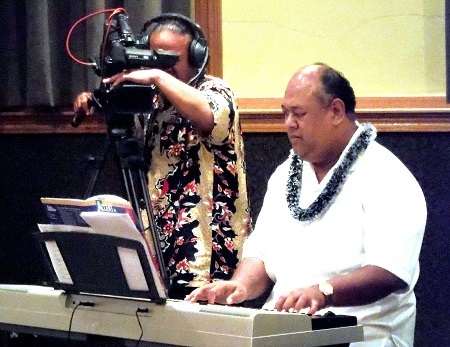 Mageo got his first experience with fiction writing while an undergraduate at UH Manoa. “From Josten’s With Love” actually dates back to an Autobiographical Fiction class he took with UHM English professor Nell Altizer. “Funny thing is, she believed that I could write, even though I didn’t think so,” Mageo recalled. Many years later, that same piece of short fiction begun for Prof. Altizer came to the attention of Prof. Marsh, and is now Mageo’s first published literary work. Marsh, who referred to Mageo “a writer to watch out for,” expressed hope that his novel will also reach the general public. “I and my Pacific Literature students await his first book with eager anticipation,” she said.